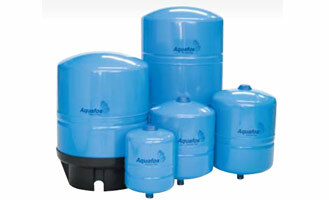 Aquafos pressure tanks are suited for all water systems: industrial, domestic and agricultural. The tanks are constructed of a polypropylene liner combined with high grade butyl diaphragm to isolate water and air. This provides a closed system for drinking water preventing the growth of bacteria and vermin intrusion. The cast stainless steel water connection is used for corrosion resistance. All tanks are quality tested to ensure the structural integrity of every tank. (Pumps or pressure vessels ordered without a tank incur a delivery fee. Please contact us for a delivery quote).